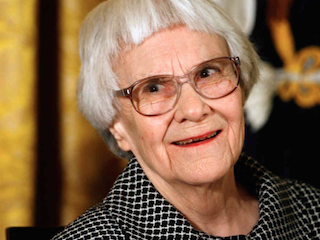 The cover of Go Set a Watchman, the new novel from the brilliantly concise Harper Lee, has been unveiled. The book was penned before To Kill a Mockingbird and follows Mockingbird character Scout Finch’s journey to visit her father, Atticus Finch. It is set 20 years after the events of Mockingbird. Now that we have all seen the cover, please feel free to overanalyze it. We know we will.